This is the second in a three-part photo series on my recent trip to San Francisco. Click here for Killer Views of the City or click here for photos from Sonoma County..
No trip to the San Francisco Bay area is complete without a day-trip across the Golden Gate Bridge to Marin County and the famous redwoods of Muir Woods. Word to the wise: go early (the park opens at 8am) before the throngs of tourists and locals descend and make parking and silence impossible. We got there around 8:30am on a Saturday, and the timing was perfect for primo parking and thin crowds hiking the paths. Another word to the wise: the road up is winding, cliff-side, often without guard rails, and has no bike lanes but plenty of suicidal bikers competing for road space. Once safely ensconced in the belly of the forest, the trees – amongst the tallest on earth and towering like cathedral spires – are astounding, and I could imagine Terrence Malick coming here to die and be buried so he can forever be under sunlight streaming through treetops. 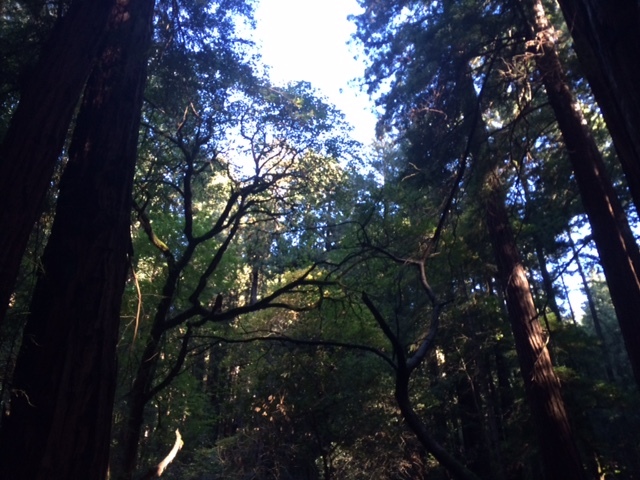 This entry was posted in Day Tripping Series, Inspiration, Photography, Travel and tagged California, Forests, Marin County, Muir Woods, Redwood Forest, Redwood Trees, Redwoods, San Francisco, Trees. Awesome pics, David. Looking at them, you thought of Terrance Malik, interesting, The Tree Life Life must have come to your mind. As for me, I think of birds. There must be spectacular varieties of birds there. More so The New World came to mind. Strangely, I don’t recall seeing any birds, though, honestly, I wasn’t looking.